Credit professionals should be skeptical of retailers in general, but especially so if it is a name that is trending toward financial distress. Any company with a FRISK® score of “5” or less, also known as the “red zone,” should grab your immediate attention. 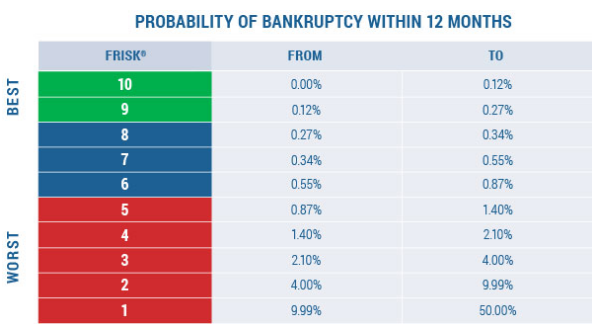 To put it bluntly, 96% of public company bankruptcies fall into the FRISK® “red zone” before they file. CreditRiskMonitor’s leverage page for Sears clearly illustrates the deteriorating capital structure; notice the trend in total debt and shareholder equity over the last five quarters. There’s no question that Sears’ financial state is more precarious than ever. Sears’ going-concern warning is further confirmation of the company’s highly distressed state. Another struggling name in the retail space is Bon-Ton Stores. While this company holds a neutral “Z” score, trending between 1.14 and 1.93 over the last two years, its actual financial picture shows serious weakness. This risk is quickly revealed by the company’s FRISK® “1,” the worst possible rating. Over the last several years, the company’s sales have steadily declined and cash flow remains inconsistent. While management recently secured an extension on a large credit facility, it doesn’t mean the company is out of the woods. Moreover, its low FRISK® score specifically highlights the need to keep a close eye on this struggling retailer. Last but not least is Gymboree. Over the last few years, debt as a percentage of total assets showed a continuous increase as the company’s intangible assets were impaired. For the period ending January 28, 2017, debt to assets reached a record high of 1.40. More important, Gymboree’s FRISK® “1” has been indicating high financial risk for an extended period of time. As of April 11, 2017, news broke that the company might be preparing to file for bankruptcy due to refinancing difficulties. More retail liquidations (Chapter 7s) have transpired recently than reorganizations (Chapter 11s), an important theme in the bankruptcy landscape. Many struggling retailers have been able to sell assets, notably well-located retail properties, to stave off liquidity risk. However, for truly weak retailers, like Sears, that tactic can work for only so long. More to the point, liquidations are often tremendously unforgiving to subordinate lenders. If we add in the increasing number of retailers that can’t survive as they exist today, risk professionals clearly need to tread carefully in this challenged sector. Sears, Bon-Ton, and Gymboree are three specific cases showing very real counterparty risk. It’s important to give your immediate attention to companies where the FRISK® score is signaling heightened risk. The FRISK® score provides purchasers and suppliers alike with the crucial lead time to address risk and adjust for it...but only if you heed the warning.